Sono molto contento di vedere che il comunicato stampa ufficiale per l’uscita di questa registrazione sia stata affidata a CHART ROOM MEDIA e che in particolare sia stato redatto dal mio caro amico newyorkese Bill McCue, gran personaggio e grandissimo fan dei LZ. E sono contento anche per il fatto che una registrazione del genere veda la luce. A 17 anni Jimmy Page era già così maturo da portare in studio una band che stimava molto, Chris Farlowe And The Thunderbirds appunto, e da produrre un demo. Certo, Page era un musicista professionista già da un paio anni, ma resta il fatto che a quell’età non è da tutti mettere a fuoco le cose in modo così preciso. These revelatory performances, available for pre-order now and scheduled for exclusive worldwide distribution via JimmyPage.com on April 30, brilliantly capture the spirit of adventure and excitement of the London music scene in the early 1960s. The band’s tightness and musical telepathy is apparent from the get-go with two hard driving instrumentals to kick off the recording. The opening track, Entry of the Slaves, features Bobby Taylor on guitar who is described by Page in the liner notes as, “the coolest stylist, both in his image and his playing, that I had seen in a guitarist who was in an unsigned band.” The incendiary Spring is Near follows and showcases the rhythm section’s individual and collective talents with both Johnny Warne on bass and Johnny Wise on drums contributing thrilling solos. On track three, Farlowe steps up to the mic and tears into a powerful version of the Ray Charles classic What’d I Say. Next up are spirited versions of the rock and roll classics Let the Good Times Roll, Sticks and Stones, Kansas City and I’m Moving On. Each track is powered along by Wise and Warne, and feature cracking guitar solos from Taylor. The volume and tempo comes down, but the intensity remains high on the soulful ballad Just a Dream, which features an emotional and heart wrenching vocal turn from Farlowe. On this track, The Thunderbirds provide brilliant dynamics and atmosphere to set the perfect mood behind Farlowe’s vocal. From here, the recording shifts gears again with Money driven along by a rumbling beat on the tom-toms from Wise and more gorgeous guitar work from Taylor. Farlowe’s howling vocal breathes new life and fire into this timeless rock and roll standard. On Matchbox, The Thunderbirds lay down a powerful and respectful homage to the great Carl Perkins classic with a groove that chugs along like a freight train barreling down the track, with every strum, pluck and beat brilliantly captured by Page on tape. Next up, Farlowe and The Thunderbirds make Don Gibson’s Hurtin’ Inside their own with Taylor’s fiery licks and Wise’s snare drum work perfectly complimenting Farlowe’s soulful delivery and his incredible range. A spirited version of Bobby Parker’s Watch Your Step closes out the proceedings with Farlowe deftly pushing the band along, climbing up his range effortlessly into falsetto and ad-libbing brilliantly into the fadeout. These recordings on The Beginning…marked the first collaboration between Page and Farlowe who went on to work together when Page was a session musician and Farlowe was on Immediate Records. Page featured on the hit single Out Of Time. In 1982, Farlowe featured on Page’s Death Wish II soundtrack, and again when Farlowe made a guest appearance on Page’s 1988 solo album Outrider. 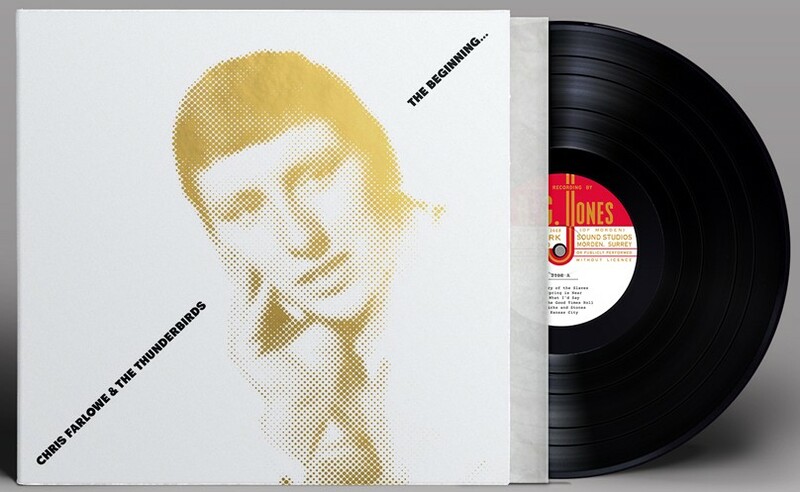 Chris Farlowe and The Thunderbirds: The Beginning is now available for pre-order at Jimmy Page.com in advance of its April 30 release date. The release is available in two editions: Standard and Deluxe. The 1-LP, 1-CD set is available signed and numbered by Chris Farlowe and Jimmy Page in a limited edition release bringing the signatures of two music legends together for the very first time. mi lascia dazed and confused. E che la cosa salti fuori adesso, in un altro secolo, poi…. mi fanno tanta tenerezza e me lo avvicinano molto. Qualcosa in comune l’abbiamo di sicuro. Ah, ecco un disco dei THE POETS….devo aver suonato in un loro singolo…. come si intitolava pure ? Vedi un po’… THE MOJOS ….ho suonato anche con loro ! No! Non posso crederci ! Un disco di EDEN KANE, quel cantante nato in india……. Ero in un suo disco…..
giovane chitarrista che suonava coi crusaders prima ancora che si conoscesse Clapton. Sono andato a riaprire l’ultimo libro dedicato a Page ed alle sue 3 vite. possedeva gia’ prima dei 18 anni. E l’autore del libro parla del periodo coi Crusaders. Sono andato a rileggermi alcuni capitoli di un altro libro sulle origini della specie zeppelin. Ma anche qui si parla dei Redcaps e dei Crusaders. Insomma Jimmy ha voluto stupirci. Di questi 2 libri molto belli sono andato a leggermi i capitoli sulla fondazione dei new Yardbirds. Non è messa abbastanza in rilievo una questione. Che Jimmy avesse in mente un gruppo con una seconda chitarra. Terry Reid ad esempio la suonava. Jimmy cerco’ Top Topham che rifiuto’. E a proposito di fondazione dei New Yardbirds ecco la fantascienza tratta da un’autobiografia di un personaggio famoso. Quindi dissi a Grant NO, STO BENE DOVE SONO, GRAZIE. Grant insistette NON SE NE PARLA risposi dopo 2 secondi.